I received on this blog several queries about the lymphedema treatment, since, as you know, Clínica Planas has an Advance Breast reconstruction, Lymphedema and Microsurgery Unit, led by Dr. Jaume Masià. As part of our dedication to achieve the excellence in the treatment results, Auditorium Jaime Planas hosted yesterday the Second Multidisciplinary Conference on Lymphedema, with more than 170 delegates. Among the speakers, we should outline the participation of the Japanese professor Isao Koshima and Dr. Corinne Becker, besides Dr. Jauma Masià´s communication. The main novelties presented on this conference are related with a more effective surgery without side effects. One of the most important news of this congress, en la jornada están relacionadas con descubrimientos que permiten realizar una cirugía más efectiva y sin efectos secundarios. Una de las más importantes, y que abre nuevas posibilidades terapéuticas en el tratamiento del linfedema, es la localización de los canales linfáticos funcionantes mediante la linforresonacia. Como novedad, el evento se ha podido seguir vía Twitter a través de nuestro canal @clinicaplanas y con el hashtag #linfcp. which opens new theraupeutic ways on the lymphedema treatment, is the use of lympho-magnetic resonance imaging to locate the functioning lymph channels. 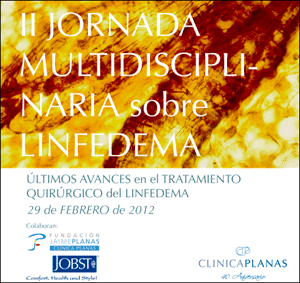 This event could be followed via Twitter on user @clinicaplanas and with the hashtag #linfcp.